This is a game that has achieved true cult status in Germany. Tipp Kick has been around for 100 years or so and continues to flourish. 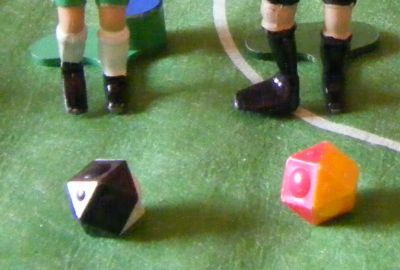 There are only eight components to the game - pitch, 2 players, 2 keepers, 2 goals and ball but literally thousands of player variations in terms of kit colours and more importantly kicking action and 'foot' style. This game has been copied numerous times including Fussball Spiel, Cup Final, soccer game and Girl Kick amongst others. This is such a simple game - a pitch, 2 diving goalies, 2 goals, multi-sided ball and 2 players - the colour of the upper face of the ball determines whose go it is next. The figures are usually cast metal and nicely handpainted. They can be purchased with a number of different feet for different kicking action - see the two examples here, a golf club type foot for chipping and a standard foot. Very simple and effective game that enables you to score some outstanding goals. The diving goalies are more for show than effectiveness.